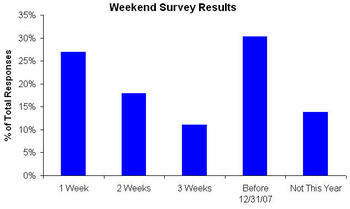 The polling is closed and the results of the weekend survey have been tallied. We calculated the percentage of total responses that fell into each category and were surprised at the bullish results. According to our readers a new record high in the S&P isn't far away, although the Ticker Sense Blogger Sentiment Poll seems to contradict that feeling. Below shows when our readers think the S&P 500 will make a new all-time high. How many total responses were there? Chris, there were 174 total responses.